Q: Cyril, if I could start with you please: major news surrounding Carlos Ghosn. As one of the architects of the F1 programme, what impact is this going to have on Renault's F1 project? Cyril ABITEBOUL: Well, I think it's fair to say that, indeed, Carlos Ghosn was instrumental in the decision to return in late 2015, but obviously it's not just one man's decision. It was debated at length in executive committee, at board level, and that was the decision of the company. We have been racing in Formula 1 since more than 40 years. We are part-way on the journey of a long-term plan - six years. Six years to build the team, six years to hopefully challenge these guys. That's where the focus is at the minute. There is a clear continuity of all the operations with Thierry Bolloré, who is no stranger to Formula 1, as he has been a director of the board of the team since 2016, so obviously this is where we need to focus and support Renault in that overall continuity. Abiteboul: We have no information that there will be any impact. We don't see any reason why there would be more impact on this programme than on anything else. For the time being: continuity, focus on what we have to do, which is complete the championship in the best possible way this weekend and then focus on the second phase of our plan in Formula 1, and this is the success that will matter, the success or lack of success, and this is where I need to deliver. Arrivabene: Not really, maybe kind of reinforcement but, as I said, but we need to swap our mind and to work a bit more on the habit to win. Arrivabene: I already gave you the answer, OK? Thank you. Q: OK, thank you. Christian, if we could come to you please. You're losing two things after this weekend - Renault and Daniel Ricciardo. Can you reflect on the contributions both of those have made to Red Bull? Horner: It's obviously had its ups and down but overall, if you look at the record and what we have been able to achieve - eight constructors' and drivers' world championships, 59 victories so far, well in excess of 100 podiums, 60 pole positions - they've all come with Renault power. Obviously that chapter comes to a close this weekend and we open a new chapter with Honda in 2019. But despite the turbulence that there has been in recent years, we hope to sign off on a positive note, and as I say, close the chapter on the Renault story. With Daniel, he's been with us for 100 races, won seven of them. He's grown up with Red Bull. He was an unknown kid from Australia who arrived in Europe when Red Bull first picked him up, taking him through the junior formulas, into Formula 1 through Toro Rosso and into Red Bull Raving. It's been great to see his development, his growth, and he's been a big part of our team for the past five season. All his seven victories, all the points he scored in Formula 1 have come in Red Bull cars. Hopefully we can give him a good sign-off in his final grand prix this weekend and wish him obviously the very best of luck for the future. But again, as one chapter closes another opens, with Pierre Gasly. Otmar SZAFNAUER: Well, after the protest was lodged it wasn't a surprise at all. But just before that we weren't expecting it really, so a bit of a surprise, but in a way it's good that all of the information can be presented to the stewards and in due course I think they'll make a very informed decision. 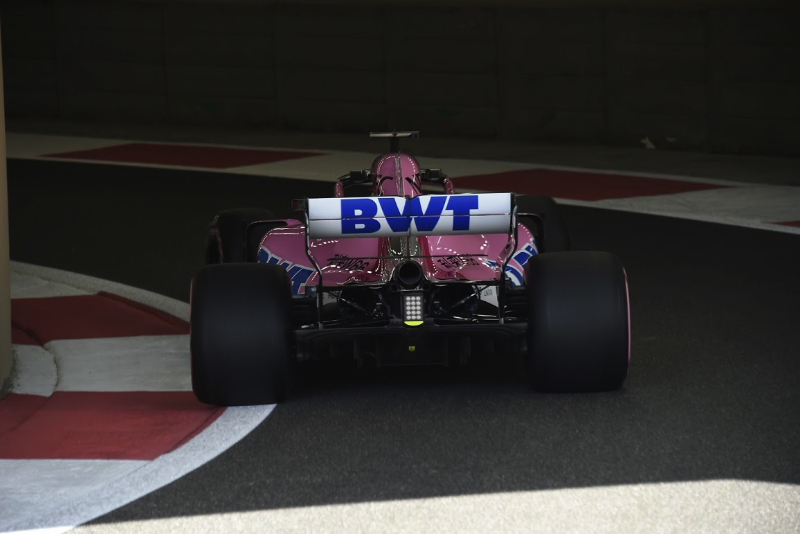 Szafnauer: Well, looking at our times from FP1, if they are representative, and I think they are, we did a little bit of long running with Esteban at the end and over a lap Esteban looked pretty competitive. We always go well here anyway, so I expect us to be the fourth quickest team. Q: Thanks. Toto, first time we've seen you in this forum since you won both of your world championships, so congratulations on that, but I wanted to talk to you about drivers and a driver that Otmar has just mentioned. Esteban Ocon was in here yesterday saying that he is going to be working very closely with Mercedes next year, so what are you plans for him? Toto WOLFF: The plans are pretty clear. He's going to be very close to the works team, to Mercedes, he's going to be our reserve driver, our third driver. We hope to maybe do the odd test with him also. We're looking at pre-season and in-season, but that is not sorted out yet. He will spend a lot of time in the simulator and be ready for a seat in 2020. Horner: If you could show him what the flags mean, as well, that would help. Wolff: Ferrari has ramped up their game over the last years tremendously and I think the performance levels were pretty close to each other. We had a few races where we were doing well and then Ferrari came back and they had the upper hand. I think this fluctuated over the season. In the end we came up with a small advantage, but they have become a formidable competitor. Definitely, if Honda goes with Red Bull next year it might be another team joining the party but with the new regulations anyway it's up in the air if somebody else could be competitive, but we very much embrace the challenge, we enjoy the fight. It's why we're here. Q: (Scott Mitchell - Autosport) Question to all five please. F1's politics usually exists in its own little world but back in Britain we have a political situation with Brexit and the exit from EU, unravelling, a bit of a mess and no-one knows what the consequences are going to be. All five of your respective teams and companies have links to Britain in some way, shape, or form. How closely are you monitoring the Brexit situation and what do you think the consequences could be at this stage? Wolff: We are monitoring it very closely because as Mercedes we have a large operation in the UK. Our motorsport division, call it 1800 people, with a large percentage of EU citizens working for the team. Personally, I try to stay out of politics but this topic is very close to my heart because we forget why we ended up with the European, 70 years ago there was a war and the European thinking was to prevent that in the future. In times where everything changes in the last two years, nationalism coming up in various countries, new alliances forming, others breaking up. My personal opinion - I'm not speaking for Mercedes - is here that we should be looking very carefully at the situation and not risk the economy of a country. So, it is a factor for us, as I mentioned the EU citizens working for us, we are importing lots of goods from the EU, we have taken steps to make sure they are not stuck on the border. Overall, not a very pleasant development. Abiteboul: Not much to add. I think we share the same concerns, we share similar footprint, or so from an industrial perspective, Renault and Nissan in particular has important factories in the UK, which is an opportunity for us to have a discussion at a proper level with the public authorities from Great Britain to understand what will be the treatment, in particular for movement of goods and people. Obviously we don't want logistics or freight to be delayed in any shape or form, as well as people. We've gone very quickly in the recent years and it's been done in particular thanks to the possibilities offered by the UK, bringing in youngsters, people are coming out from school, we don't want that to change. That would be dramatic for Formula One - but I have full trust in the authorities of Great Britian to understand this is not in their interest to lose what is one of the pillars of British Industry, which is motorsport and Formula One. Horner: Living in the UK, we're living and breathing it like some of the rest of you guys and you get a little bit bored with, every time you turn on the news, hearing about Brexit: what the deal is; what it isn't. Theresa May, she's obviously doing the best she can with not a great hand - little bit like Chase Carey really! - and it's a complex situation but I think over the next couple of weeks there should start to become some clarity and I think the bottom line is that people will continue to do business with the UK if we're competitive and remain good at what we do. Formula One is something that the UK has excelled at in recent years and it's no coincidence that four of the teams sitting here are based all in the UK. Yeah, there's obviously some turbulence around at the moment but hopefully, in the coming weeks and months, they'll be a solution found. There has to be one, ultimately, and it won't affect how we go about our daily business. Szafnauer: We too watch with keen interest because we also hire… we have many employees from the EU and we're based in Britain and have to cross borders quite a bit into the EU to go racing. So, we're watching with keen interest but I have faith that the UK and EU governments will come to an equitable solution that'll be good for all of us. Q: And Maurizio, as someone who represents a team not based in the UK, your thoughts on Brexit? Arrivabene: Of course, the situation is not ideal for Formula One so I have that they will be able, the proper authority, they will be able to find a solution. I mean, looking at the situation into the future, I'm thinking about the solution for the overall Formula One. If I'm looking at the situation from the Ferrari perspective, if everything is going in the direction that is announced at the moment, I suspect that in the near future we will find a lot of people that they're knocking on the door of Maranello - but it's not really the best scenario, talking about the overall Formula One, so I hope they find a solution, not only for Formula One in general that could accommodate any kind of historical cooperation, and is going to look forward for the future and think about the best development for all of us. Q: (Dieter Rencken) To all five. After this race it's exactly two years before the expiration of the present bilateral agreements, known as the Concord Agreement. Do we have sufficient time to sort out sufficient technical, commercial, sporting etc. matters before it expires? Arrivabene: The time, it's quite tight, you know better than me. So we need to move quickly - but in the meantime we need to avoid any move that could damage our company. I'm talking about Ferrari as I think my colleagues, they are talking about the company that they are representing. So, the time is quite tight - but we don't have any hurry to move forward and maybe to create a mess. Talking about something that is in front of us now. We have regulation for next year, they were supposed to give more possibility to the overtaking, at the moment the first feedback that I got from our driver is that most probably that objective is not achieved. The result is that we are spending a huge amount of money next year to change our car, then we need also to sit together and to understand how could be the situation for the engine cost for 2021 and maybe thinking about that - because we are continuously talking about cost cap but at the moment, I'm going to see the costs, that they are increasing instead of decreasing. So, we need to stop a bit and, instead of rushing, we need to think on what we are doing now, because what we are doing now, it could potentially influence future decisions. Wolff: Maurizio said it all. I would share his opinion. Abiteboul: Yeah, I think it's fair to say that it's tight. That's why it's important that we stay steady and try to be supportive of what FOM's new management is trying to achieve - because we need visibility. I mean, when you talk to sponsors, new sponsors not in Formula One, they want to have visibility. They need to have at least three years visibility and we can't offer three years any more. Because, as Dieter was saying, it's only two years that's left on the current Concord - so clearly we are really pushing but also helping stakeholders to try to come up with a clear plan, if or what, on each of those aspects which are important aspects. Horner: As we were talking earlier, it's a bit like Brexit. We've got to find a deal, we've got to find a solution. There's 24 months. There's a hard stop, which is at the end of 2020 and there's only the simple factors of money, regulations and commercial plans for the future to sort out. So what could possibly hold that up! Szafnauer: Yes. I think we're running out of time and the sooner, the better, and the later we leave it, the higher the cost to react to whatever changes or differences there are going to be. Hopefully by the end of this year we'll have some clarity on regulations, governance and financial distribution. Q: (Andrew Benson - BBC Sport) Cyril, the press release about the new president of Renault Sport talked about your ambition to win races by 2021 but you're spending less than the two guys to your right and the one guy to your left. And the budget cap is being pushed back. Are you faced with the question of either spending more money or accepting you can't win or pulling out? Abiteboul: It's a bit early to say that we'll pull out because we will not manage to succeed. Frankly, I don't want to be moaning about the situation because when we joined Formula One we knew the situation. What's quite remarkable is the arms race and the relentless spend in order to win which I fully respect and I think it has afforded a great racing season this year so we just need to see how we can emulate on those guys at some point. At some point there will be a different deal on money distribution, at some point there will have to be a limitation of spend because in our opinion it's just not sustainable and I believe - correct me if I'm wrong - but I believe this is a shared feeling from everyone. So then it's just a timing issue but if the plan is delayed by one year then it's delayed by one year but I think what matters is the principle and the principle that we must be in a position to win races at reasonable cost, given the value of Formula One. This is the equation that we want to be seen returning to reality in the next few months. Q: (Alaric Gomes - Gulf News) Toto, this is something off the beaten trail: Toto you are so much involved in philanthropy and especially the Mary Bendet Foundation and giving to society. Do you feel that you, as a body, as a sport, should get together and have a cause wherein you can all come together and contribute to society or community? Wolff: I believe that philanthropy is something that is very personal. We are here to compete in Formula One. We are representing great brands and each of us will have his thoughts of how to give back to the society. Whatever I do, I don't do it in public because it's close to my heart and I wouldn't want to share any of the reasons why I'm doing it, but I feel in the time where everything is about yourself and the ego is running away with everybody and it's about self demonstration on social media - how great you are - we have an obligation, each of us, to give back a bit, but obviously we have to decide for ourselves how and when. Q: (Matt James - Sport 360) Cyril, we've already talked about bridging the gap to the other three big teams. You've got Daniel coming on board next season, what are your expectations, your hopes for him? Abiteboul: It's a bit early to exactly mention or disclose our exact target for next year because first we would like to finish this season in the best possible way but obviously we need to keep on progressing: P9, P6, P4 in the championship in two years, in three years so we would like to see that progression continuing. We know that obviously the further you go the bigger the steps and the more demanding they will be. We would like to see, for instance, bridging the gap closer to the top teams in qualifying, in races, not being lapped, in terms of points scoring, so this is the type of target that we will announce at the start of next season but you need to expect from us that we keep on progressing and completing the construction of the team and we expect Daniel to play a key role in that, just like he played a key role in Red Bull's drive, in our opinion, on track but also off-track because we also feel that we need someone to embody that charge. Nico's doing extremely well as a driver so I also look forward to that line-up to really properly represent the efforts and the ambitions of Renault in that new cycle. Q: (Beatrice Zamuner) Maurizio, could you tell us a bit more about the role of Laurent Mekies who we saw in the paddock? Is he going to work closely with Binotto? Arrivabene: No, Laurent Mekies is going to be sporting director. Q: (Dieter Rencken) Cyril, earlier on you sounded surprisingly optimistic that the Carlos Ghosn affair won't affect the Formula One operation. But if we have a look at the all the unknown factors, for example, at the moment it's not even clear he will return to Europe and also the fact that corporate scandals, the effect they've had on people like Volkswagen who left WEC, they left rallying etc. Is it really realistic to be so optimistic that it won't affect the Formula One programme? Abiteboul: In fairness, I don't think I was willing to sound optimistic because it's a substantial piece of development for the whole group. I think my message is simply that there is a continuity plan for all the operations of the Renault Group as well as Nissan and Mitsubishi. Formula One is part of this operation. It's an object and an activity which is well known, very visible and receiving lots of exposure with clear expectations of return on investment and contribution to the business. I think that the reason why we joined Formula One in the way that we joined Formula One back in late 2015 are still here today: for exposure, for technology development. There is no reason why those factors are suddenly going away in case of any development, for which I don't want to speculate at this point in time. So if Formula One is still a good value proposition in the past, it has no reason not to be also in the future. But I'm just saying that it will, in my opinion, be in our hands and this is where I will be focusing my efforts rather than in speculation. It's in our hands to deliver the best possible result also for the best given cost to the company that will then continue to monitor this activity as an any other activity. I have absolutely no indication that for instance, Thierry Bollore is not keen on Formula One. Again, he's a director of our company, has very good knowledge of what we are doing, so optimism, no scepticism, just focusing on facts and what we need to deliver. Q: (Andrew Benson - BBC Sport) Maurizio, you talk about needing a winning habit but Sebastian's won 52 Grands Prix, you've won six this year, and you won five last year. How much more of a winning habit do you need and what exactly does that mean? Arrivabene: We need to win enough to win the championship, of course. Then it depends on the performance of the other teams, how many. Having said so, the habit to win, it's very simple. If you are doing one-two it doesn't have to be an exceptional event. It must be a habit, as I said. In that way you are changing and you swap your mentality from a fighter to a winner. That's it. Q: (Lennart Bloemhof - De Volkskrant) Toto, getting back to Brexit, earlier this year you said you weren't sure if it would be possible to work in the UK in the near future because of all the uncertainties. Has that feeling changed and does Mercedes already have an emergency plan when it comes to hard Brexit? Wolff: I think the free movement of EU stuff should be pretty sorted, so I'm not worried in the short term that this is going to affect us but obviously division could have effects that we can't see yet, beyond free movement of people and goods. And we can't the see effect yet. As a matter of fact there is nothing on the table yet, we don't know what the outcome is for the next couple of days, whether there will be a deal or no deal or hard Brexit. Hard Brexit would be terrible for everybody involved, I think. So it's a moving target at the moment, I would say. But I'm less worried for personnel, to come back to your question, than I was a while ago. Q: (Scott Mitchell - Autosport) Maurizio, just to follow up very quickly what you said about Laurent Mekies. You've obviously hired him because you see him being an asset to Ferrari; what do you see as his strengths, where do you think he'll improve what Ferrari does? Arrivabene: It's perfectly… Laurent is perfectly matched in all the strengths that are requested in a sporting director. That is the reason why we hired him, this is the reason why he's going to take this for next year. Q: (Andrew Benson - BBC Sport) Maurizio, to follow up on your answer, with respect, you didn't not take the championship to the wire because you didn't get enough one-twos, you didn't take the championship to the wire because the driver in the team made too many mistakes, too many times during the season. Arrivabene: What you want me to do? Q: (Andrew Benson - BBC Sport) I want you to answer the question as to how you are going to make that not happen. Arrivabene: I give you an answer, I give you an answer, having said that what you said is not correct because we started the season in very good shape and then as Sebastian said yesterday, he made mistake, then from Monza onwards we were not there with the car and this is a fact, too, if you're talking about facts. I don't want to point the finger at the team or on the driver. If we are losing, we are losing together. If we are winning, we are winning together. And that's it.